History in 3-D. By Bob Zeller. Chronicle Books, San Francisco, 2000. Hard cover, 10 x 9 3/4, 120 pages, index, profusely illustrated. Brand new condition. Incidents of The Rebellion. Civil War Photographs Seen As They Were Meant To Be Seen. In 3-D. View The Tangle Of The Wilderness; The Lost Cyclorama; The Rarest Gettysburg Photo; A Slave Church; The Civil War In Color; The CSS Florida; The Western Theater. Complete with Viewer. 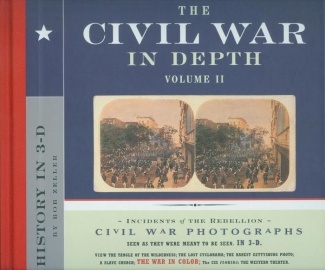 Superb, scholarly reference work that is a must have for all Civil War photograph collectors. Many of the images in this book were never published before which includes a rare portfolio of color Civil War images! Comes with an easy to use stereoscopic viewer, which unveils each image in glorious 3-D as it was originally taken and meant to be seen. Never has the Civil War been seen with such extraordinary clarity.